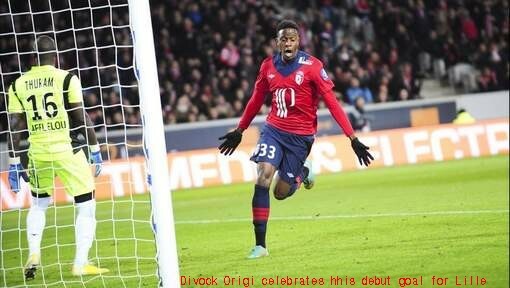 Kenya football fans were recently excited by the news that the 17 year old Divock Origi scored on his French league debut while playing for OSC Lille. Divock Origi is the latest member of the Origi clan to make it big in the world of football. The Origi family has 6 players through two generations who have excelled and excited Kenya football fans for the past 30 plus years. Popularly known as “Makamu”, Austin was the first of the Origi clan to emerge on the scene. A product of highway secondary school and Ziwani estate, he joined Gor Mahia in the early 1980s as a midfielder. At the time he was hard pressed to earn a spot in the starting line-up given that Kogalo already had a galaxy of stars in midfield. He soon switched to the sweeper position and ended up becoming one of the best central defenders Kenya has ever produced. There are two theories that explain his nickname “Makamu”. One is that when he first joined Gor Mahia, he always appeared as substitute. The second one was that in the mid 1980s, he was the vice captain of the team hence the nickname “Makamu”. Kenyan fans will remember Austin for his memorable performance marking Liberian Legend George Weah in 1989. At the time, Weah was the most feared striker in Africa and would later end up being voted European player of the year while helping AC Milan win the Champions league. Harambee stars coach Mohamed Kheri assigned Austin the task of man-marking Weah. He completely marked Weah out of the game rendering the Liberian hapless. Another fond memory occurred during the 4th All Africa games semi final match against Malawi in 1987. The match ended in a tense penalty shootout. After six penalty attempts , Kenya had missed three while Malawi had missed four. The entire nation watched as Austin stepped up to take the last penalty which if he scored would see Kenya reach the final. Tension filled the air as Fans across the nation saw a pensive Austin Oduor make the sign of the cross as he approached the ball. When he converted the penalty, the crowd and the entire country went into a frenzy. Coach Reinhard Fabisch ran from the bench screaming as “Makamu” leaped onto his chest in celebration. The entire country went wild. 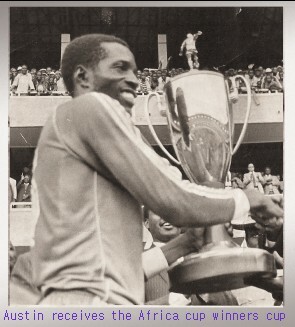 But Austin will mostly be remembered for captaining Gor Mahia to the Africa cup winners cup win in 1987, the only time a Kenyan team has won a continental event. He marshalled the defence and kept opposing strikers at bay. Austin was also the captain of the Kenya national team in the late 1980s. One aspect of his game that was less noticed was his accuracy with long passes which he delivered with sublime accuracy. Mike Okoth became the first Kenyan ever to play professional football for a top tier team in Europe. He first came to fame as a goalkeeper when he helped Iterio secondary school clinch the national schools championship in 1987 while playing alongside Henry Motego. At the time he also played goalkeeper for Shabana FC. After conceding 5 goals against Kenya Breweries, Okoth decided to leave goalkeeping for good and became a striker. He surprised fans when he finished amongst the league’s leading scorers in 1989. Following his goalscoring exploits for Shabana, Kenya Breweries made him an offer and he joined Kenya Breweries. At Breweries he continued his goal-scoring exploits thus earning a place in the national team. 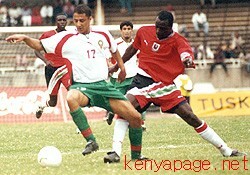 In 1991, he scored the crucial goal that helped Kenya qualify for the Africa nations cup. Kenya seemed destined for elimination as the minutes waned. With only a few minutes left and with the crowd at Kasarani loosing hope, he rose skyward to head home a cross from Sammy Onyango “jogoo” to give Kenya the crucial second goal that allowed them to beat Sudan 2-1. Okoth later left to play in Oman along with his elder brother Austin Oduor and several other Kenyan players. He joined Bochar FC. At the 1992 Africa nations cup Okoth impressed Belgian talent scouts and was signed by top tier side KV Ostende. He went on to play in the Belgian top league for a decade, featuring for KV Ostende, Harelbeke and Racing Genk. He then concluded his playing career in the second tier for clubs like Molenbeek and Heusden Zolder. Perhaps his most memorable match for Harambee stars was an Africa nations cup qualifier against Mozambique in 1993 in which he scored two goals and set up another as Kenya beat Mozambique 4-1. It was the first time he had returned to play for Kenya after moving to Europe and fans instantly noticed that his game had climbed several notches higher. He had immaculate ball control and his crosses were sublime. If he had been good in the Kenyan league, he had become excellent after playing in Belgium for only a year. This was a stark contrast to the Kenyan players who went to Oman. They often returned home with diminished skills. What Mike Okoth achieved in Europe is admirable. It is very difficult for an African striker to stay in a top tier European league for a decade. Almost two decades after he went to Belgium, the only other Kenyan striker who has made it in Europe is Dennis Oliech. Other Kenyan strikers have either failed trials or did not last a season. The fact that Mike Okoth Origi played there for over 10 years is a testament to his hard work. It is something that upcoming Kenyan players can emulate. Anthony is the next of the Origi brothers. Like Austin, he attended highway secondary school where he played alongside future stars like Peter Ochieng “Pierre”, John Busolo, Bramwell Mwololo and Gerald Kasuku who later became famous when he was banned from football for viciously attacking referee William Ngaah with flying kicks while playing for Baruti FC. Anthony Origi started his career playing for Mumias Sugar in the late 1980s before joining Kenya Breweries where he was a dependable left full back. he was part of the Kenya Breweries team that won succesive CECAFA club cups in the 1980s. After retiring from football, he became team manager of Tusker FC. Jared Origi was the fourth of the Origi brothers. A product of Jamhuri secondary school, Origi came to fame while playing for upstart Utalii FC in the mid to late 1990s. At Utalii, Origi became one of the most dependable defenders in the league. He soon earned a call up to the national team. In 1999, Jared left Kenya to pursue a soccer scholarship at St Gregory’s college in Oklahoma. He earned NAIA All America honors in 2000 and 2001. At St Gregory’s he played alongside another former Kenya international, Eric Ochieng “Cantona”. Arnold is the son of legendary central defender Austin Oduor Origi. Origi is well known for his sharp reflexes and acrobatic saves. He is arguably the best goalkeeper that Kenya has produced since Mahmoud Abbas. Gor Mahia fans of that era will remember that his Father Austin Oduor Origi made a few appearances during frieendly matches as a goalkeeper. It is therefore likely that Arnold got some of his sharp reflexes from Austin. He certainly inherited Austin’s vision and ability to anticipate the moves of opposing strikers. Arnold started his career at Mathare Youth Sports Association. Interestingly, his father Austin tried to discourage Arnold from pursuing a career in football given the tribulations that Kenyan footballers are faced with. Austin instead wanted him to focus on academics. However it soon became obvious that Arnold was destined for great things. In 2006, he left Mathare to join Tusker. Less than a year later he left for Norway where he joined SK Moss in the Norwegian top tier. The most memorable game he played for the national team came in 2011 during a ANC qualifier against Uganda in Kampala. The Ugandans needed to beat Kenya and sure of doing just that given that they had held Kenya in Nairobi and had eliminated Kenya from the CHAN cup recently. However Arnold Origi was in sensational form on that day and pulled off incredible save after incredible save to deny the Ugandans. It was almost an exact replica of the performance of Mahmoud Abbas in Kampala 20 years earlier when Kenya beat Uganda in the CECAFA cup final. 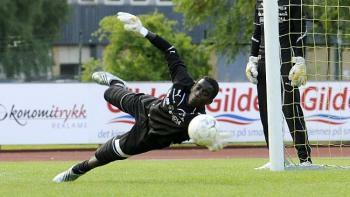 As of 2013, Arnold Origi plays in the Norwegian top tier for Lillestroem and is Kenya’s first choice goalkeeper. Divock is the son of striker Mike Okoth Origi. He is the latest of the Origi clan. Born in Ostende Belgium in April 1995, he started his career at the Genk youth academy. He has played for the Belgian U15, U16 and U19 teams. In 2010 he joined French side Lille to play for their youth team. And in 2013, he made a glorious debut for the Lille senior team. Coming on as a second half substitute, Divock scored the equalizing goal to help Lille hold Troyes in a French top tier encounter. His Father Mike Okoth Origi was elated. He took the opportunity that was given to him due to the absence of players. It is fantastic that he jumped at the chance. Such opportunities are rare at 17. He should appreciate their fair value and be patient. What is important is to continue to evolve and gain experience. Divock is already much better than I was, he is faster and technique” Okoth Origi said. FKF Chairman Sam Nyamweya has approached Divock about playing for Kenya. “I will talk to the Government to ensure that he is given a passport and I have a feeling he wants to play to Kenya. The new constitution allows dual citizenship and he is still a teenager so he can choose which country to play for,” FKF boss Sam Nyamweya said. However given the tribulations of playing for Kenya and the shambolic organization of the national team and of football in Kenya, it is unlikely that Divock will make a decision to play for Kenya this early. The only hope for Kenya is if Belgium does not show interest in capping Divock early. Didier Drogba decided to play for the Ivory Coast when by age 25, France had not capped him. This likely will not happen with Divock Origi given his early stardom. Interestingly, Divock’s father Mike Okoth, in a recent interview with a Kenyan TV station stated that virtually no one playing in the Kenya premier league had any chance of being signed to a top tier European side. He said that the absence of youth development amongst Kenyan clubs means Kenyan players have little chance of passing trials at a European team. He has been vindicated because the KPL players of the year between 2010 and 2012 have all failed to make it in Europe after attending trials. Kenya football authorities would be best advised to listen to Mike Okoth Origi. Not only did he play in Europe for over a decade, but hhe has groomed his son into an top calibre player, good enough to play in the French league at 17. This entry was posted in Kenya Football articles and profiles, Kenya Sports news and commentary. Bookmark the permalink.